Let's look at the numbers for our county from the state data book. These are the official numbers from the Office of Financial Management (OFM). The 2014 numbers aren't ready yet, so we'll take a look at the 2013 figures. The total population of our county is 16,000. We rank 32nd out of 39 counties in that regard. Based on information from the data book, we are able to get a rough idea of the number of adults in our county ... and that number is 13,448. It's probably a bit more because we don't have exact numbers for 18 and 19 year olds, but we'll use 13,500 as an approximate number of our adult resident population. So, we have 13,500 adults, and according to the latest figures available from our County Auditor, we have 11,985 registered voters (down slightly from 2012). That means we have about 1,500 unregistered voters, which is about the same number of voters as live on Lopez (2,000 registered voters). We might, therefore, think of our 1,500 unregistered voters as the equivalent of a "missing island" of unrepresented residents. No telling why they are unregistered ... they might be disengaged ... or some might be non-citizens. We don't know their status, but considering that some of our most important elections have had margins of victory of one hundred votes or less, the "missing island" could be influential if it were ever able to become engaged. Among registered voters, we generally have quite high voter turnout (~8,000 votes), so our elections are determined by about 60% of the adults in the county, or about half the overall population). More people die here every year than are born. Whatever population stability or growth that we experience comes from net migration here. Regarding employment, our average number of employees according to the state data book is 5,201, and this figure is in line with data from the Bureau of Labor Statistics (BLS). The BLS data also shows that monthly employment peaks at about 6,400 jobs in August and dips to about 4,700 jobs in January. We interpret that to mean that our county is able to provide about 4,700 year round jobs and about 1,700 seasonal jobs ... meaning that 25% of our jobs are seasonal. Overall employment is flat, and statistics from the Regional Economic Analysis Project show that we lag both the state and the nation in job growth. Government, according to the state data book, provides 971 jobs or about 19% of total average employment. It is our second largest employment sector, as measured by number of employees (accommodation/service jobs are our largest); however, since our government jobs are relatively highly paid, government is our largest employer by dollar volume at 24% of wages paid. On a per capita basis, the total compensation of government employees is 27% above our county average. The only employment sector that pays significantly more than government work is utilities. Our biggest employment sectors are government, accommodation/service, and construction. No other employment sector breaks double digits percentage wise. We think of ourselves as an agricultural community, but agriculture/forestry/fishing/hunting combined don't even crack the 1% threshold. The much touted "recreation" employment category (i.e., think Friends and PSP targeted awareness of "Our Environment is Our Economy") is our lowest paid employment sector, with wages 37% below the county average. It accounts for 2% of our employment. Looking at the numbers above, you will notice that we have 13,500 adults, but only 6,400 have any kind of job. More of our adults (7,100) don't work than work. The state data book also gives us some insight into the incomes of these two groups. Total wages paid in the county is $163 million, but total income earned by all residents in the county is $854 million. If we assume that our workers have little to no income beyond their wages, then that would mean that the average income of workers here is about $31K, whereas the average income of adult non-workers is $83K. In other words, it would suggest something we already know ... that jobs here are not creating wealth here. We import our wealth. The data also show that we have the lowest percentage of workers and lowest earned wages (as a percentage of total income) of anywhere in the state. In terms of average wages, we are 37th out of 39 counties ... and yet, on an average basis, we rank 2nd of 39 counties in terms of per capita income. Averages do not tell the story of our economy here ... so beware. We will delve more into the state data book numbers in the next post, especially as it relates to property values, taxes, and the (dis)connection of government to the local economy. Not very long ago, the word "buildout" was standard fare in the government lexicon of this county. It was equal measures of bogeyman, planning-speak, and rallying cry. "Buildout" is the theoretical maximum population of the county if all parcels were developed. The whole "buildout" topic was fertile ground for predictions of a dystopian San Juan future. And speaking of a dystopian future, one of my favorite examples of fictional Friends writing was their 2002 Spring newsletter titled Managing Growth. The subtitle was "News from the Voice of the Environment, Spring 2002." It's a hoot and a classic, and I urge everyone to read it. In addition to wild predictions of growth and the Friends bragging about how they were saving us, it contains a profile of then-President Lynn Bahrych. Lynn Bahrych, University of Washington professor, high-powered Seattle attorney, heroine of the Comp Plan battles, and delightful companion — a true renaissance woman. How did FRIENDS get so lucky as to get Lynn Bahrych as Board President? Delightful. It actually says "delightful." Another consequence of growth will be an increase in crime, probably at a faster rate than the increase in population. As we live closer and closer together, and as the gap between “haves” and “have nots” widens, we can expect significant growth in crime rates. Attorney and FRIENDS Board member Maile Johnson comments: “Growth breeds crime at an accelerating pace – if current trends continue, the County will need court space beyond anything the BOCC has considered.”[Note: we've seen drugs and crime grow here, but it hasn't been because of growth. If anything, it's been because of lack of growth and opportunity]. 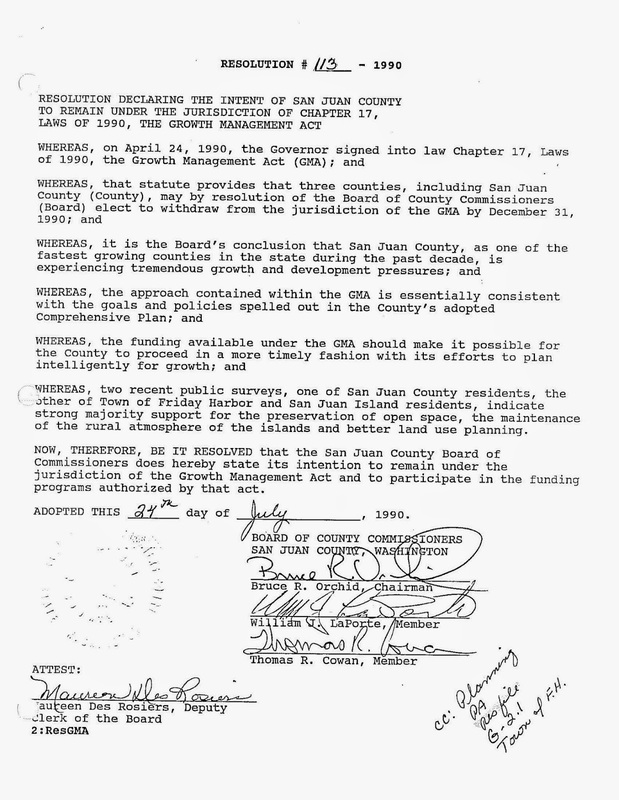 But back to buildout specifically ... when our County adopted its first Comprehensive Plan around 2000, it was required to downzone in rural areas and upzone in "urban" areas. The result was that 75,000 acres in the county (out of 110,000 total acres) were downzoned. According to estimates from Planning Commissioners at the time, more than 10,000 development rights were eliminated in order to bring our Comprehensive Plan into GMA compliance. After that happened, the Friends then pushed to do away with guest houses too, and they were largely successful. The net result is that, several years before the current job-killing CAOs even appeared, our longterm ability to grow and build in these islands was crushed. And, in addition to the Friends, many familiar names participated in (and benefited from) these events. Note that Tom Cowan was a BOCC member who approved of our GMA participation, who later that same year was a driving force in founding the Land Bank, and who still is a Land Bank Commissioner to this day, who went on to found the Marine Resources Committee and the Marine Stewardship Network, and who has had a long and successful career as a consultant for Ecology, and who has worked on everything from the San Juan Initiative to Puget Sound Partnership activities. Rhea Miller was a BOCC member during Comp Plan downzoning, which coincidentally also resulted in upzoning in certain areas to allow for rural residential clusters. Rural residential clusters is the scheme that was invented to "solve" our affordable housing crisis via developments such as the Lopez Community Land Trust, which Miller co-runs. She's not alone ... one of the former executive directors of the Friends runs the San Juan Community Home Trust. These people worked to restrict housing by tens of thousands of units and also eliminate relatively low cost and affordable guest houses, while promoting their own pet high-density developments. The list of beneficiaries of the "new GMA economy" invented during the 90s and 2000s is long, and they still hide in plain sight at CD&P (or DCD as it is now called), the various Land Trusts, the Conservation District, the LIO, the Madrona Institute, the Stewardship Network, and on many of our county committees. The effect of the GMA and the war-on-buildout was to eliminate many private opportunities for growth and economic development, and replace it with a growing mountain of government sanctioned bureaucracies, committees, and quangos ... attachment points for the revolving door of government officials and insiders ... places where careers were built and riches were made, lubricated by grant funding that poured in to "save the San Juans". It's as if government growth body-snatched the private growth that might have happened. Government grew while our private economy perished. The San Juans weren't "saved" ... the San Juans that everybody knew and loved were legislated out of existence for 30 pieces of grant money, and the GMA has been the Via Dolorosa. Where do we stand on buildout today? Nearly 60% of parcels have some development on them already. We estimate that a further 20% of parcels are protected from development (e.g., Land Bank, parks, National Park, National Monument, etc.). Consequently, we are probably close to 75% built out (i.e., 60% out of 80% available), and if we consider that many people own more than one parcel and will probably never build on every parcel they own, our buildout proportion may be even higher. We are probably close to full buildout. The Office of Financial Management puts out growth projections every five years for every county in the state. Each county projection consists of a high, middle, and low projection trend. The projection used by our County in planning documents and forecasts has been the middle trend; however, we have consistently failed to achieve the growth trend of even the lowest projection since 2002. The most recent growth projection for San Juan County has a flat middle growth trend, and the lowest growth trend projection shows a decline. We have a growth problem. (Except for tourism) We aren't growing at all. San Juan County had a larger population in 1920 (3,605) than in 1960 (2,872). For most of San Juan County's history, population growth has been negligible. Then the 70's hit. The population of the islands doubled. The Growth Management Act (GMA) was enacted in 1990. We were not required to fully plan under the GMA because our population was less than 50,000, but our growth rate exceeded 20% over the previous decade. That triggered a special provision of the GMA which allowed us to opt out of fully planning if our County Commissioners were to vote for exclusion. However, our Board of County Commissioners (BOCC) at the time affirmed our full participation in the GMA via Resolution 113-1990 (see below). While we had phenomenal rates of growth for several decades (103% during the 70s, 28% during the 80s, and 40% during the 90s), we were growing from a low base. In raw numbers, we only added about 12,000 people to our population from 1970 to 2010. Annualized growth over that time was 3.2%. Since 2010, annualized growth is far less than 1% ... we are essentially back to negligible population growth. 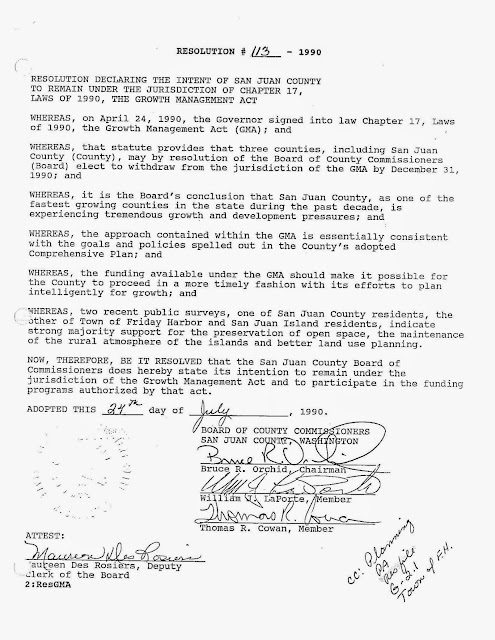 In 1990, the Land Bank was formed. At its inception, it was forecast to protect 5,000 acres and 10 miles of shoreline over the next quarter century. According to the Land Bank's annual reports, it had achieved this goal by 2013. More people live in King, Pierce, and Snohomish Counties than in all the rest of the state combined. The 12,000 people added to San Juan County's population over the 40 years from 1970 to 2010 is equivalent to about 6 months of population growth in King County (based on their growth from 2004 to 2014). Lopez Island (population 2,177) is approximately the same size as the island of Manhattan, which has a population of 1.62 million. In fact, if current rates of growth in Washington state were to continue apace, the entire state wouldn't achieve the current population of just New York City until another 25 years. When the future of the county is discussed, we often hear the admonition that "We don't want to become Nantucket ... or Jackson Hole!" Truth be told, no community should ever want to be us. By almost any measure, we are an economic and demographic wreck ... all the more so because most of the people who live here are in denial about it. Today we begin a series of articles about the economy of San Juan County. We are not who we think we are, and this series will focus on facts, not marketing hype. We will show the facts and numbers as presented in government statistics and university studies, not tourist brochures. We begin with income inequality. We present two simple items of information - one from the New York Times and another from a 40-year study of income inequality of the Pacific Northwest prepared by Eastern Washington University. The 2014 study from Eastern Washington University can be found here. It shows San Juan County to have the greatest income inequality of anywhere in the Pacific Northwest. The study looked at 143 counties, including all the counties of Washington, Oregon, and Idaho; and 24 counties in western Montana. The New York Times information can be found here. It's based on research from Harvard University, and it's focus is income mobility ... how likely you are to change your station in life? It shows that growing up in San Juan County is a misfortune for the future earnings of our children compared to growing up somewhere else in the nation. We are below average in helping poor kids up the income ladder ... but for average or rich kids, we're a tragedy. After growing up in San Juan County, the future earnings of average-income and rich kids is negative compared to growing up somewhere else in the nation. In fact, for those cohorts, we are at the the bottom of the pile. Growing up almost anywhere else is better for the future earnings of our children than growing up here. 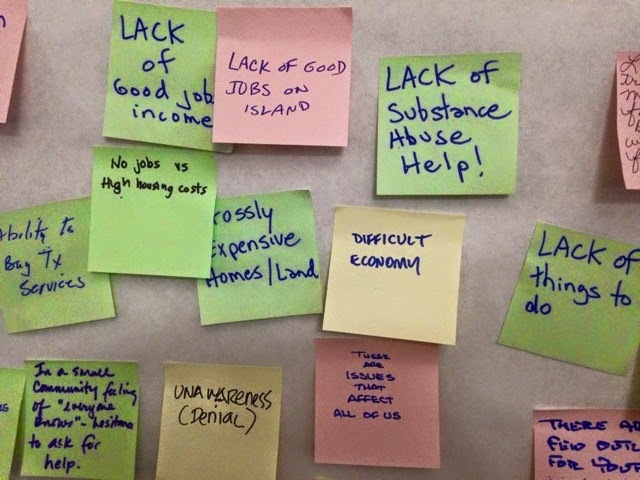 A friend sent me the photos below of notes from a community meeting on one of our islands. The meeting was convened to discuss the growing drug problem in these islands. 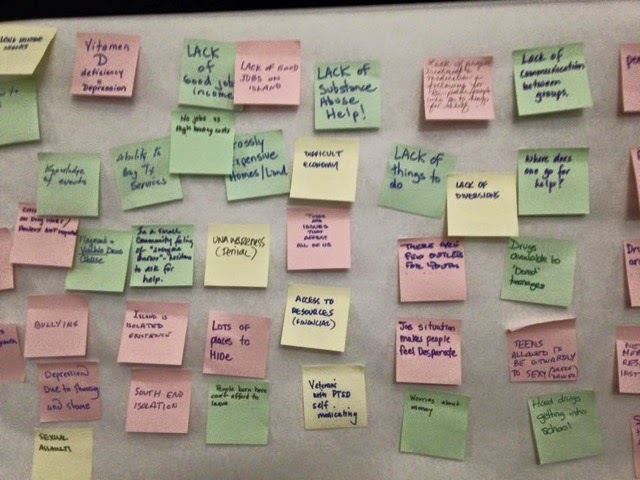 People were asked to write down the root causes of the drug problem.